Are you planning an event? I am available for weddings, private parties, colleges, corporate events, trade shows and restaurants! Whether you are looking for large stage shows, parlor, close-up, strolling or intimate social gatherings, I provide an interactive, fun, clean (yet mature) experience that your guests will enjoy and remember for years. I don't use an assistant, your willing guests become the stars of the show! I never embarrass anyone. Have you been watching all of the magican/mentalist specials on TV and thought "I wish I could get that for my next event!" Well, call Greg Raven and your guests will be amazed. I readily admit that everything is a trick. But can you figure it out? My boyfriend and I were walking around downtown St. Petersburg and were looking for something to do. We saw that there was a new Latin restaurant that everyone was talking about, so we decided to check it out. As it happened, Greg Raven was performing that night. I HATE MAGIC. But after just a few minutes, I was absolutely hooked. Whenever you think "magician", you think of some guy doing really old tricks at birthday parties that my six year old niece could figure out. Greg Raven is AMAZING! He used almost everyone in the audience for something. He bent a spoon in someone else's hands, he predicted a drink that we all made up on the spot (which was sealed in an envelope that everyone inspected), and he even told someone what word they were thinking of from across the room! All I can say is that I've never seen anything quite like that before. And before you decide that magic is dull, stupid and aimed at kids, do yourself a favor. Take the time to meet and watch Greg Raven in action. It made me remember what it was like to have my mind blown!!! He is excellent in all events I have seen him perform - people of all ages enjoy his talent! I would recommend him for any type of event! I always ask, "How did he do that?" Tampa Bay's Best Kept Secret!!! Unbelievable!!! This guy with goofy hair walks in and proceeded to blow our minds. Here was a room full of lawyers, giggling like schoolchildren. Amazing! He predicted words chosen at random, he bent spoons, he knew exactly what I had drawn from the other side of the room! Funny, fast, clean and easily one of the top performers I have ever seen!!! How is this guy NOT on television??? I use my five senses to create the illusion of a sixth. I use misdirection, verbal subterfuge, sleight of hand and psychological subtleties to achieve mental miracles such as precognition, psychokinesis, remote viewing, card tricks mixed with quick witted humor in a fun, mysterious night of mind magic and mental mayhem!!! The most hardened skeptics have a hard time explaining what he does. From book tests to metal bending, from blindfolded effects (with duct tape and quarters to eliminate cheating) to predictions, I simply amaze from start to finish. 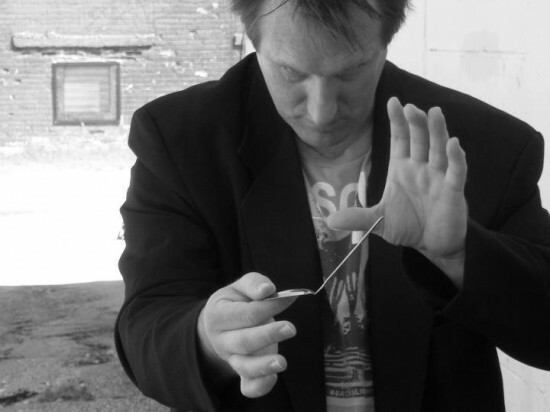 Mentalist Greg Raven originated in Chicago and for several years resided in Michigan. Recently Greg has appeared in Southwest Florida to astonish the Sunshine State with his amazing shows of "mind magic and mental mayhem". From large stage shows and corporate events, to close up magic, performing in local theaters, comedy clubs, cruise ships, large conference centers, local businesses or private functions, Mentalist Greg Raven’s favorite part of performing is the reaction he gets from the audience. Whether it is shock, laughter, awe, surprise, annoyance (as he thwarts their attempts to figure out how he did it) or bewilderment, he enjoys creating a reaction. Mentalist Greg Raven’s unique mix of mentalism, audience participation, humor and magic must be experienced! Greg Raven uses a mix of sleight of hand, suggestion,"thought reading", psychology, conjuring techniques and showmanship to baffle, befuddle and amaze his guests. If you have never experienced Mentalist Greg Raven's performance, book him today! See him in action On Youtube!!! Simply look up Mentalist Greg Raven!!! "Greg, Your recent performance at the New Port Richey Elks Lodge was SPECTACULAR!! We had a great crowd for a Saturday night in mid summer. The audience was in awe at some of your 'mind-blowing' actions. You worked the crowd and everyone felt they were part of the show. Again, thanks for a great evening of fun, mind bending and whatever else you call it! I hope we can book you soon again!! " "As an Activity Director for many years, I am always looking for new entertainment. I have hired magicians in the past, they were fun, but missing that WOW factor. Greg Raven has proven to be the answer. He leaves the residents and staff amazed and wanting more. After performing at our community informally, I took a chance and booked him to entertain at our Holiday Open House. He was a big hit with all ages,"How did he do that?" was the question of the night. Mentalist Greg Raven has many great tricks, or I should say illusions up his sleeve." Greg mixes his quick wit with a fun mind boggling mastery of mentalism to perform a show you won't soon forget. Professional, courteous, and affordable. Make your next event the one everyone will talk about for years!!! Greg Raven: A Mind Bending Experience! I only require the space to perform, a few good lights, and a willing audience!!! My act is always evolving, but it always contains the same components. I perform prediction effects, book tests (someone randomly selects a word from a book and I reveal the word), spoon bending, drawing duplications (someone draws something, and I draw the same thing from across the room) and lots of humor. If you have a message, brand or name that you want incorporated into the show, I have the ability to customize it accordingly! Recent review: Followed through professionally and took care of his customers even after the show.